Before the season began, Watford were joint-third favourites for relegation, considered by bookmakers to be better only than Cardiff and Huddersfield. Javi Gracia was fifth in the betting to be the first top-flight manager to be sacked. General opinion was clear, and scathing. Fast forward eight months and Watford are jostling with Wolves for both seventh place in the top flight and, today, a spot in the FA Cup final. If, as many always expected, they have to plan for a competition other than the English top flight this summer, then it will be the Europa League rather than the Championship. There was some logic behind the pessimism: between Gracia's appointment in January last year and the end of the season Watford had won four of 14 league games, scored not a single away goal in seven attempts (plus one in the FA Cup), and had then spent a modest £24m on summer transfers. Their recruitment amounted to Gerard Deulofeu, a Spanish forward of impeccable provenance but proven inconsistency, Ben Foster, a 36-year-old goalkeeper from a freshly relegated club, and a handful of squad players whose impact has been as negligible as their cost. The combined expenditure on their seven signings was a little over half the fee they received for selling Richarlison to Everton. Then the season began, and Watford started winning. They eased past Brighton in their first game, battled past Burnley in their second, overcame Crystal Palace in their third and then came back from a goal down to defeat Tottenham. After four games they had 12 points, two fewer than Huddersfield's total after 32. Watford have had good starts before and have been in the top 10 in mid-September in every season since their promotion to the Premier League in 2015. This is the first time it has been sustained. "We're really helping each other now," José Holebas says, praising a more collective attitude. "That was missing. It was: 'Look at what he does.' That does not exist this season. It's not like a one-man show here. The manager is also a big part of it, because he's not really heard speaking rude or something. He's a really normal guy and I think that was missing." When Gracia arrived last season he was hired as a firefighter, to arrest the alarming decline that had started under Marco Silva and to secure the club's Premier League status. He did so, though results were inconclusive enough that even among the squad there was some uncertainty about whether he would continue into this season. But his task for the new campaign was entirely different and he has approached it in a totally different way. A full pre-season has allowed more finely honed tactical work, and training has been more focused than under Watford's recent managers. The humble, quietly spoken persona that Gracia presents to the media is not a front, but he is also extremely demanding. Players are expected to arrive on time - £100-a-minute fines for tardiness made headlines earlier this season - and to work hard once they do so. Often managers reduce the intensity of fitness work as the season progresses, but this one has not. In previous seasons Watford have achieved their target of 40 points and then lost focus; this season they set no such target and have experienced no such loss. "We targeted nothing in the beginning. That's what I like this season," says Holebas. "We're not looking where we can end, I think that's the best way and that's what we're doing. That's why we're doing really good this season and everyone is really focused, in games and also in training. It's quite different this season and that makes us better as a team now." Gracia says he tries "to create a feeling of belonging" in the group, and this seems to be one of the key factors behind their relative success. Some of this work has been fairly straightforward - pool and table tennis tables have been installed at the training ground, encouraging players to spend time together once they have trained and eaten - and some is down to sheer luck. There is no recipe for team spirit; it just so happens that this group - aided by the club's modest summer recruitment, which has allowed players to build on established relationships rather than forcing them to make new ones - and their honest, humble manager have clicked. Watford's results have been astonishingly consistent. That early win over Spurs excepted, they have achieved little against the leading teams, but they have lost only once at home (after going down to 10 men against Bournemouth with an hour to play) and twice away to clubs outside the top six. If the half-dozen sides at the top of the table and all results involving them were magically excised from the records, leaving a 14-team division decided only by games those teams have played between themselves, at the start of this weekend the Hornets would be five points clear at the top of it, with a game in hand over Everton, their closest rivals. This success has come at relatively modest cost. The Pozzo family, which owns both Watford and Udinese, are famous for the breadth of their scouting network but the players they seem most proud of are not those nobody else knew, but the ones nobody else valued. That they had no rivals for the signing of Foster last summer was, they feel, down to other teams judging players on their age rather than their performances. Craig Cathcart, signed from Blackpool on a free transfer in 2014 and the club's leading appearance-maker this season, is seen by some as a journeyman defender of limited ability but Watford consider him wildly undervalued: quite tall, quite quick, a threat at set-pieces and capable of playing on either side of a centre-back partnership. Not every signing has been a success but Watford's first XI, with Deulofeu by a margin the most expensive at £11.5m, has provided a level of value that is surely unrivalled among their Premier League peers. If results have been consistent so too has selection, with the same 10 players normally filling 10 of the 11 starting berths. In some cases this reflects their continued excellence while in others it demonstrates a lack of depth, but Gracia's success in, as he puts it, "making all the players feel they are part of this squad" looks all the more remarkable given how little football some of them have played. Summer will bring fresh challenges and new threats to the stability that has helped to fuel Watford's rise. Like all overperforming teams, some players will have attracted attention elsewhere and the club will have to deal, most notably, with the likely departure of the influential midfielder Abdoulaye Doucouré. 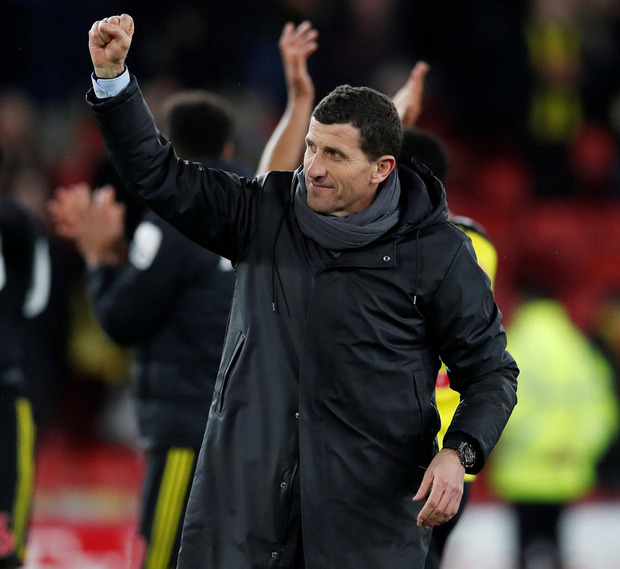 The test that lies ahead for Watford and their likeable manager will be to adapt successfully once again for next season and another completely new challenge.